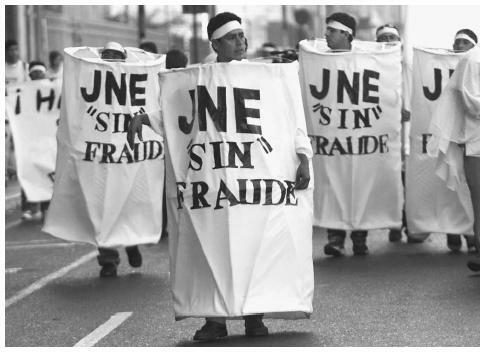 University students protest against possible fraud in the 2000 elections in Peru. The word "SIN" refers to Peru's national intelligence agency, which allegedly used dirty tricks and intimidation to give the incumbent President Alberto Fujimori an unfair advantage over his opponent, Alejandro Toledo. Fujimori later resigned and Toledo gained the presidency. purposes in peacetime. Rumors, lies, and other forms of disinformation were made public by the Soviet Union to discredit the United States, the latter being the context in which the word is generally applied. The KGB coined the Russian word dezinformatsiya ; it came into the English language as disinformation. The technique of disinformation goes back at least to 1918 with the end of World War I. Disinformation as a KGB weapon began in 1923 when I. S. Inshlikht, deputy chairman of the GPU, then the name of the KGB, proposed the establishment of a special disinformation office to conduct active intelligence operations. Soviet active measures. Soviet active measures refer to the influence operations organized by the Soviet government. These include white, gray, and black propaganda, as well as disinformation. White propaganda was created by the Information Department of the Communist Party and included those publicly identified Soviet channels as Radio Moscow, Novosti, and pamphlets and magazines as well as official Soviet government statements. Gray propaganda was organized by the International Department of the Communist Party and used such channels as the foreign Communist Parties and the network of international Soviet fronts. Black propaganda was prepared by the KGB and included agents of influence, covert media placements, and until 1959, assassinations. Forgeries and disinformation were used by the Soviets in all modes. The first effective disinformation campaign was during the Korean Conflict. This was a major Soviet disinformation campaign that generated media attention. The Americans were accused of going into Korean villages during the Korean conflict (1950–1953) and shooting villagers, or killing them with biological weapons and chemical warfare. In fact, the Soviets used anthrax in Korea to kill men, women, and children, and then blamed it on the Americans. An attempt is now underway with the Cold War History Project at the Woodrow Wilson International Center for Scholars, Smithsonian Institution, in Washington, DC, to counter this account, especially through the work of Katherine Weathersby who discovered that Soviet documents obtained through a Japanese researcher belied these rumors and accusations. The issue re-surfaced in the book United States and Biological Weapons: Secrets of the Early Cold War and Korea (Indiana University Press, 1999) by Stephen Endicott and Edward Hagerman. Endicott was the son of one of the men who helped to disseminate the disinformation campaign, James Endicott. On September 9, 1982, President Ronald Reagan designated the United States Information Agency to lead an inter-departmental effort to counter Soviet propaganda and disinformation. For an advisory body, the administration created the Active Measures Working Group in 1981 to bring together the information the various agencies held to counter Soviet disinformation and forgery. It served as a clearinghouse to expose such information and it had permission to use classified documents and any other resources that were required to meet this goal. The Working Group was chaired by the State Department with representatives from State, Central Intelligence Agency, Defense Intelligence Agency, Arms Control and Disarmament Agency, United States Information Agency, and the Defense and Justice Departments. The Working Group ended in 1991, two years after the collapse of the Soviet Union. AIDS disinformation campaign. A major effort for the Working Group was the AIDS disinformation campaign, a controversial topic that had basis as a Soviet disinformation campaign. A sensational disinformation story appeared with allegations that the United States deliberately created AIDS in the laboratory to use it as a weapon. The KGB started the story in 1985 with placements in both Soviet and foreign newspapers; by September, 1986, it became a major campaign when an English language paper that actually originated in East Berlin carried the story. "AIDS: Its Nature and Origin," was distributed at the Non-Aligned Movement Summit in Harare, where it contained pseudo scientific verbiage, but the only evidence linking the origin of AIDS to U.S. military laboratories was the following unfounded statement: "The first appearance of AIDS exactly coincides with the opening of a P-4 laboratory at Fort Detrick [Maryland]—taking into account the incubation period. This is also indicated by the fact that the spreading of AIDS to the world emanated from New York, a city in the neighbourhood of Fort Detrick. The assumption that AIDS is a product of the preparation of biological warfare can therefore quite plainly be expressed." The Soviet disinformation campaign accused the U.S. government of creating the AIDS virus as a weapon against black people and the story quickly appeared worldwide, despite U.S. protests that Fort Detrick, in Maryland, was hundreds of miles from New York. In April 1987, U.S. Surgeon General C. Everett Koop advised the Soviets that if this campaign continued, "direct U.S.-Soviet collaboration on AIDS research would be impossible." The KGB then began winding down the worldwide campaign, but other countries continued to endorse the disinformation. In Africa, stories circulated for years that the United States created the AIDS virus. The U.S. Information Service (USIS, USIA overseas) staff responded with accurate information that countered these charges and defused the situation. In Pretoria, South Africa, and in Lilongwe, Malawi, USIS information was able to refocus the media on AIDS prevention rather than on false blame. World Trade Center attacks. After the terrorist attacks of September 11, 2001, a disinformation campaign originated that 4000 Jewish persons did not show up for work at the World Trade Center on that day. Authorities have not determined the origin of the disinformation, but have concluded that its source was probably from an Arabic region, as the circulated disinformation did not mention the fact that the hijackers were Arabic. This was the first recorded account of an urban legend that has swept the Arab world, and no facts in it have ever been substantiated. The disinformation appears to be based on concern expressed by the Israeli government for the fate of 4,000 Israeli residents in New York, a small number of whom worked at the World Trade Center. Within a matter of days it was no longer 4,000 Israelis who were supposed not to have turned up to work, but 4,000 Jewish persons; then reports appeared that no Jewish persons died on September 11. In fact, many Jewish Americans died in the attack, as well as four Israeli citizens—two in the World Trade Center and two on hijacked planes, according to the Israeli Foreign Ministry. In August, 2002, the U.S. Government countered allegations that Abdul Salem Zayef, the former ambassador to Pakistan, had been tortured and killed in captivity at the United States' Guantanamo detention center in Cuba. After the U.S. Embassy in Islamabad alerted the Department of State that the story was appearing in the Urdu press and that allegations were being broadcast as fact on state-controlled media, the State Department worked with elements in the Department of Defense to track how the disinformation was being disseminated, and to prepare guidance. In April, 2003, the Embassy in Islamabad also countered allegations about damage to the Adhamiya Mosque in Baghdad, which houses the Imam Abu Hanifa, with relevant CENTCOM news releases and information given for a story in the New York Times . Additionally, in April 2003, the U.S. Embassy in Beirut, Lebanon, responded to allegations about "tranquilizer chemical weapons" with the Department of Defense's statement that "Incapacitating agents are agents that put people to sleep by slowing the nervous system considerably. The Department of Defense does not possess any incapacitating agents and has no plans to conduct research in this area." Depleted uranium. A Gulf War disinformation campaign that began when a South African minister spoke to the media about the supposed genocide caused by the use of uranium depletion weapons in the 1991 Persian Gulf War. This disinformation was started by Minister Doug Rokke in a presentation to members of the South African Parliament on January 31, 2001, when he made a number of assertions about depleted uranium. Media reports quoted him saying that he knew only one person from his team who was not sick from depleted uranium exposure, and represented that tests revealed 5,000 times the permissible level of uranium in his body. Rokke was presented as the Department of Defense's (DOD) expert on depleted uranium and the director of the Pentagon's depleted uranium project. His comments resulted in a renewed fear about the effects of spent uranium depletion weapons. In order to correct the record, the Defense Department revealed Rokke as a private citizen not affiliated with the U.S. Department of Defense. Following the war, Rokke was attached for duty to assist technical experts in the recovery and decontamination of radioactive material and equipment. The team of approximately 10 people was led, not by Rokke, but by a civilian from the Army Munitions and Chemical Command (AMCCOM). Rokke's primary role was to facilitate the recovery operations by ensuring the team had the proper support. In the following years, Rokke reported varying numbers of ill or dead co-workers. DOD staff compiled a list of 29 names of people Rokke reported to be on "his team." Staff members were able to interview 22 of them. Approximately 15 of the 29 people Doug Rokke had identified actually worked on depleteduranium contaminated vehicles. Two of the 29 had died, however, neither of these two veterans was named as having worked with depleted uranium. Iraqi propaganda. Early in 2003, the White House issued "Apparatus of Lies: Saddam's Disinformation and Propaganda, 1990–2003" (Washington, D.C.: U.S. Department of State, 2003) compiled by State and Defense Departments disinformation specialist Todd Leventhal. This report highlighted the apparatus used by Saddam Hussein and his cadres to deceive the Iraqi people and the international community. The oppressive and totalitarian nature of Saddam Hussein's regime enabled this deception. This regime, which became expert at obfuscation during the 1991 Persian Gulf War, had more than a decade to perfect these practices before it was finally toppled by the allied forces in March and April, 2003. In December, 1998, when United Nations weapons inspector Richard Spertzel became exasperated by Iraqi evasions and misrepresentations, he confronted Rihab Taha, the woman the Iraqis identified as the head of their biological weapons program and asked her directly, "You know that we know you are lying. So why do you do it?" She replied: "Dr. Spertzel, it's not a lie when you are ordered to lie." In January, 2003, Taha refused to be interviewed by U.N. weapons inspectors, but after Operation Iraqi Freeedom, Taha surrendered to U.S. authorities on May 12, 2003. Crafting tragedy: To craft tragedy, the regime places civilians close to military equipment, facilities, and troops, which are legitimate targets in an armed conflict. The Iraqi regime openly used both Iraqis and foreigners as human shields during the Gulf War, eventually bowing to international pressure and releasing many of them. Iraq also placed military equipment next to or inside mosques and ancient cultural treasures. Finally, it has deliberately damaged facilities and attributed the damage to coalition bombing, and has attempted to pass off damage from natural catastrophes, such as earthquakes, as the result of bombing. Exploiting suffering: To exploit suffering, Saddam Hussein blamed starvation and medical crises—often of his own making—on the United Nations or the United States and its allies. The Iraqi regime caused or actively ignored hardship and then aggressively exploited the Iraqi people's suffering. During the last decade, the Iraqis have aggressively promoted the false notion that depleted uranium—a substance that is relatively harmless and was used for armor-piercing munitions during the Gulf War—has caused cancers and birth defects among Iraqis. Scientific evidence indicates that any elevated rates of cancer and birth defects are most likely due to Iraqi use and testing of chemical weapons. Exploiting religion: Experts know that Saddam Hussein was a non-religious man from a secular—even atheistic—party. In order to exploit religious sentiments, he adopted expressions of faith in his public pronouncements, and the Iraqi propaganda apparatus erected billboards and distributed images showing him in other acts of piety—all while his regime prevented citizens from engaging in religious pilgrimages. Inflammatory disinformation designed to incite Muslims against its adversaries has also been used. Corrupting public records: To corrupt the public record, the Iraqi regime used a combination of on-therecord lies, covert placements of false news accounts, self-inflicted damage, forgeries, and fake interviews. Other main tools of Iraqi disinformation included restricting journalists' movements; false claims or disclosures; false man-in-the-street interviews; self-inflicted damage; on-the-record lies; covert dissemination of false stories; censorship; edited or old television footage and images; and fabricated documents. Recent U.S. government reports, including "A Decade of Defiance and Deception," documented these deceptions regarding UN resolutions and weapons inspections. In order to raise awareness of the many other Iraqi forms of deception, particularly those likely to be repeated, "Apparatus of Lies" examined the facts behind Iraqi disinformation and propaganda since 1990. The U.S. Defense Department countered these disinformation tactics by embedding over 300 world journalists with United States Marines during Operation Iraqi Freedom in March-April, 2003. The author wishes to acknowledge Herb Romerstein for his contributions to this article. Bittmann, Ladislav. The KGB and Soviet Disinformation. Washington: Pergamon-Brassey's International Defense Publishers, 1985. Romerstein, Herbert. Soviet Active Measures and Propaganda: "New Thinking" and Influence Activities in the Gorbachev Era. Toronto, Canada: Mackenzie Institute for the Study of Terrorism, Revolution, and Propaganda; Washington, D.C.: National Intelligence Book Center, 1989. Shultz, Richard H., and Roy Godson, Dezinformatsia. Washington: Pergamon-Brassey's International Defense Publishers, 1984. U.S. Congress. House. Permanent Select Committee on Intelligence. Soviet Active Measures: Hearings. 97th Congress, 2d Session. Washington, D.C.: GPO, 1982. U.S. Congress. Senate. Committee on Foreign Relations. Subcommittee on European Affairs. Soviet Active Measures: Hearings. 99th Congress, 1st Session. Washington, D.C.: GPO, 1985. U.S. Department of State. Active Measures: A Report on the Substance and Process of Anti-U.S. Disinformation and Propaganda Campaigns. Washington, D.C.: The Department, 1986. ——. A Report on Active Measures and Propaganda, 1986–87. Washington, D.C.: The Department, 1987. ——. A Report on Active Measures and Propaganda, 1987–1988. Washington, D.C.: Department, 1989. Douglass, Joseph D. "The Growing Disinformation Problem," International Security Review 4 (1981): 333–353. Kux, Dennis. "Soviet Active Measures and Disinformation: Overview and Assessment," Parameters, Journal of the U.S. Army War College 15, no. 4: 19–28. McDonnell, Sharon. "In From the Cold," American Journalism Review (June 1995): 16–17. Romerstein, Herbert. "Disinformation as a KGB Weapon in the Cold War." Prepared for a Conference on Germany and Intelligence Organizations: The Last Fifty Years in Review, sponsored by Akademie fur Politische Bildung Tutzing, June 18–20, 1999. U.S. Information Agency. Soviet Active Measures in the Era of Glasnost. Prepared at the request of the U.S. House of Representatives, Committee on Appropriation, for presentation at a hearing on March 8, 1988, by Charles Z. Wick, Director, United States Information Agency. (Washington, 1988).